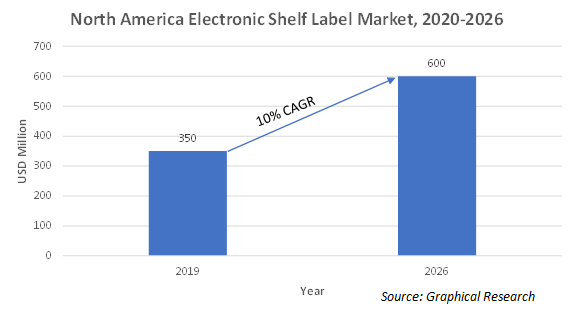 North America Electronic Shelf Label (ESL) Market demand exceeded USD 160 million in 2017 and is projected to grow at over CAGR of 14% up to 2024.The North America electronic shelf label market is driven by the vast presence of retail stores and development in the retail sector. The early adoption of the advance technology and usage of smart products by the consumers further accounts for the high technology demand. Presence of both small and big retail stores including specialty stores, factory outlets, hyperstores, and malls is boosting the adoption of electronic shelf label market owing to the enhanced product display benefits. They provide customers with overall product information and price specifications by displaying modules on electronic paper or LCD devices. Growing adoption of infrastructure development initiatives in these stores is responsible for the increase in technology demand. Segmented e-paper in the North America ESL market is expected to grow in North America. Rise in demand of these products is due to the benefits such as enhanced multi-color displays, and low power consumption. They are available in a varied range of alternatives for deployment in low to high-end applications that further aids the increase in consumption. e-papers are majorly used in retail stores to display the technical products and provide easier customer communication. RF communication technology platform in the North America electronic shelf label market has developed substantially in the recent years. The growth is attributed to its easy usage and adoption in advanced technical products including wireless connectivity such as Bluetooth and NFC. This technology allows transmission of digital coded signals and two-directional communication with product tags that ensure regular upgrades and feedback and is contributing to the North America ESL market. Hypermarkets in the North America electronic shelf label market occupied the largest revenue share owing to the adoption of automated products. ESL offer hypermarket owners with cost efficiency benefits as they do not require continuous human involvement for regular maintenance. Automation and digitization of these retail stores benefit both owners and customers by eliminating the product marketing hassle. Key players in the North America electronic shelf label market include Pricer AB, SES-Imagotag, E Ink Holding Inc., LG Innotek, Wincor Nixdorf, M2Communication Hosting, CEST, Altierre Corporation, and Solu M. Major companies in the industry focus on developing highly technical and smart owing to the high spending capacity of customer base in the region.